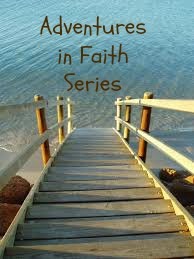 Today is the final post in the Adventures in Faith series. Thanks for joining the journey. Let’s continue together with new adventures, beginning tomorrow! What’s one adventure that thrilled you? What’s an adventure that challenged you? Consider how you grew through each. When Mom looked out the kitchen window, she saw us in the second-story barn window. My older sisters held me by my legs and arms, and they swung me back and forth several times before tossing me out the window. What she couldn’t see was my landing. The garage obscured her view. She charged out the door in a panic, rounded the corner of the garage and…saw the hay truck stacked with straw and me rolling in laughter and delight. What a great day! Mom, on the other hand, didn’t share my joy. She was relieved I was okay, but her initial fright gave her enough momentum to yell at all of us and demand we stop the fun. Bummer! I was having a blast. It might not have been the safest way to pass the time, but many of the “fun” things we did on the farm weren’t necessarily safe. Some of the most memorable experiences are the adventurous ones. We’re creative through adventures. We learn through adventures. And we often struggle through adventures. Struggling often produces growth. Adventures often involve risks and usually involve excitement. Approach today with an anticipation of adventure. Learn. Struggle. Be creative. Make some memories. This is it: the launching pad of the next season of your adventures. Your adventures didn’t just begin, and they’re not going to end anytime soon, especially as you commit and yield to God’s will. He has a journey of adventures for you. Embrace every single one. Soar! For more stories about life growing up on the family farm, check out Farm Days. Posted on November 30, 2014 October 6, 2014 by SusanHLawrencePosted in Adventures in FaithTagged accountability, adventure, daily challenge, daily devotional, daily reading, discipline, faith, friendships, mentoring, reflection questions, training, womens ministry.